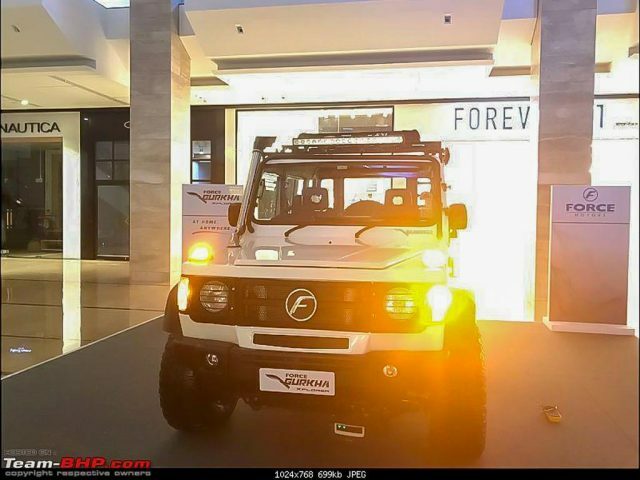 Force Motors Limited is selling the Gurkha off-roader under Xplorer and Xpedition variants with the former being the only model offering 3- and 5-door configurations. Despite the obvious differences between them, both are powered by a 2,596 cc, four-cylinder, inline, FM 2.6 CR, common rail, BS-IV compliant diesel engine. The engine is good enough to develop a maximum power output of 85 horsepower at 3,200 rpm and 230 Nm peak torque between 1,400 and 2,400 rpm. It is mated to a five-speed manual transmission that propels all the four-wheels through a single-lever selective 4×4 with high-low options (RWD in short wheelbase version). The Gurkha is a highly potent off-roader rivalling against Mahindra Thar and is due for a big update likely in the early parts of 2019. 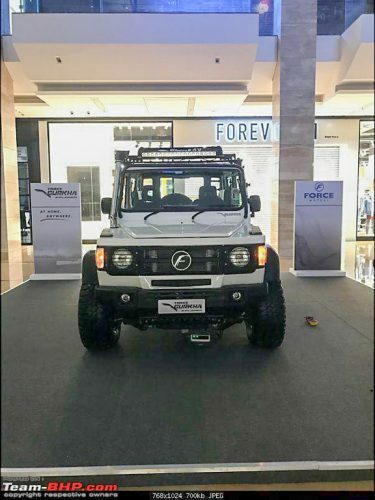 Dubbed the Force Gurkha Xtreme, it is gets a much needed leap in performance as a 2.2-litre turbocharged diesel engine produces 140 hp and 320 Nm torque. The Mercedes-Benz OM611 derived engine is connected to a five-speed manual ‘box, which is also sourced from the German manufacturer. Initially expected to enter India later this year, it could take as long as early 2019 to reach showrooms. 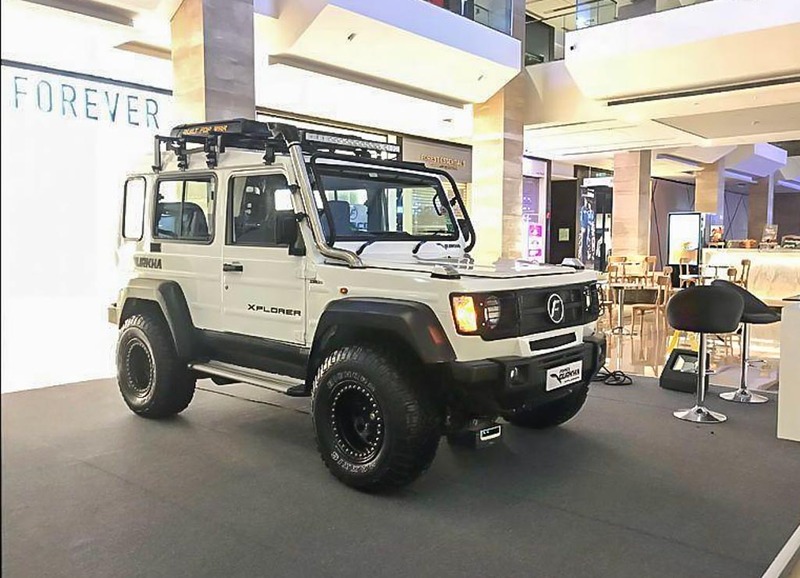 Showcased at a mall in Pune, the Gurkha Xtreme looks like a beefed up version of the existing model. Changes have reportedly been made to make the Xtreme more comfortable on and off tarmac and gets a dual mass flywheel ditching the single-plate hydraulically actuated dry friction unit to provide continuous energy. The overhauled suspension meant multilink units are used at the front and rear, while the track is 40 mm wider. The exterior boasts an unmistakable Merc G Wagon looks with authentic squared profile. The boxy appearance of the three-door model is further accentuated by standard snorkel, prominent wheel arches and wider 245/70 R16 tyres. Compared to the current Gurkha, Force could make changes to the interior for improved fit and finish. With that said, the rather outdated cabin is expected to continue in the Xtreme. It has water wading depth of 550 mm, ground clearance of 205 mm (5 mm lower than the Xplorer) as well as 44 degrees, 35 degrees and 28 degrees approach, departure and ramp breakover angles. Due to the arrival of more powerful engine, the new Force Gurkha Xtreme is expected to be priced at around Rs. 13.5 lakh (on-road).